Parading the arrested persons at the command’s headquarters in Kaduna on Monday, the State Commissioner of Police, Umar Shehu, said that at about 11:30pm local time on October 20, the Command’s chief armourer, Nanbol Audu, a deputy superintendent of police, came to the armoury with two unknown persons in a private vehicle to steal arms and ammunition. The car was discreetly parked behind the armoury as the officer and the two other suspects loaded arms into it. The commissioner said police officers on guard suspected foul play and immediately stopped the vehicle from leaving the premises while both chief armourer and his two accomplices were arrested. Mr Shehu further explained that the two suspects came from Jos, Plateau State, on arrangement to purchase the said firearms from the armament officer. 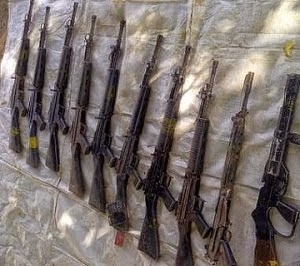 Further investigation revealed that one of the two civilian suspects is a blacksmith who specialises in manufacturing locally made firearms and a cash sum of 400,000 Naira were recovered from the suspects.